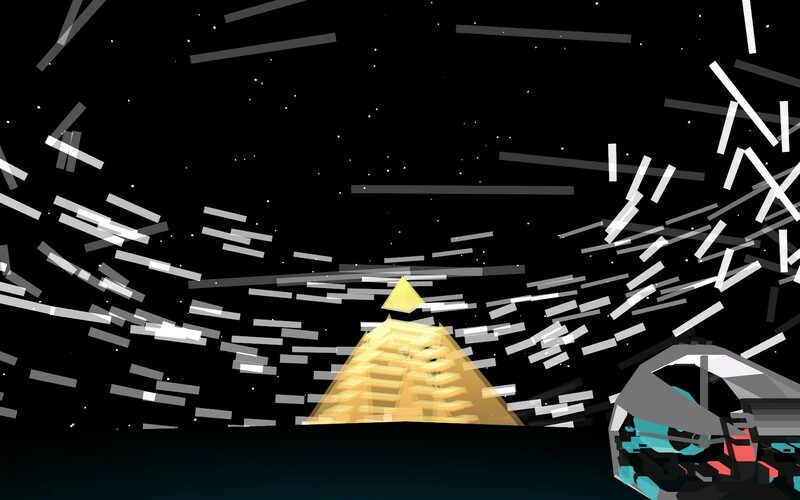 The Refined Geek » MirrorMoon EP: For All The Worlds Left Uncovered. MirrorMoon EP: For All The Worlds Left Uncovered. I’ve often wondered what the world of experimental indie games looks like to someone who doesn’t have a long history with games. Whilst the average age of a gamer is pushing past 35 there’s still got to be a good chunk of people who didn’t grow up in the golden age of gaming which means that many of the conventions relied upon in these games would simply be unfamiliar to them. Usually this is done in aid of getting out of the way of the user’s experience (tutorials are by far the worst immersion breakers, bulldozing through the 4th wall) and it’s something I appreciate although I recognise how this might be of limited appeal to others. MirrorMoon EP is one such game, relying on your sense of curiosity and exploration to uncover the vast world that it encompasses. I am slowly learning to travel in space. Time is a meaningless variable that slips through my fingers. Stopping requires a lot of energy while moving feels almost like staying still. Breathing is hard inside this machine. I need to stay calm. And with only that to go on you’re dropped on a mysterious moon, one that has a strange relationship with another nearby celestial body. 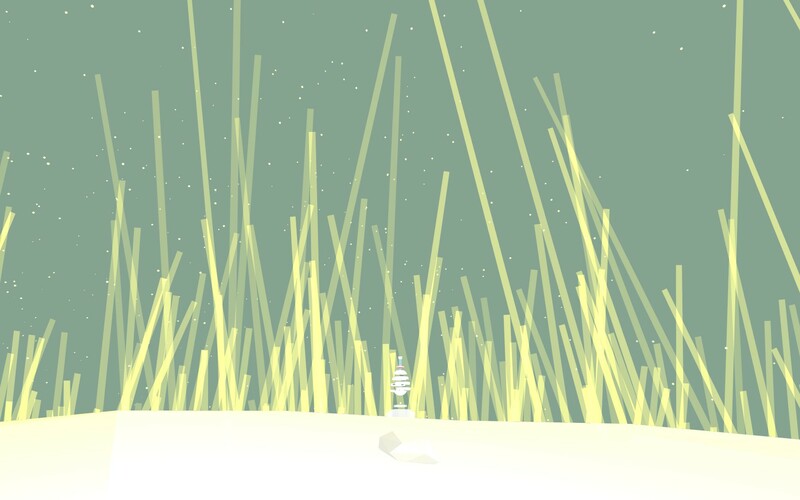 MirrorMoon EP feels visually similar to other minimalistic exploration games like Kairo favouring texture-less environments with solid colours covering every surface. As I alluded to earlier I believe that this is done in order to focus you on the gameplay above everything else and indeed since the control mechanism doesn’t allow you to sight see particularly well (more on that later) it does feel like MirrorMoon EP is doing its best to get out of your way. As a fan of minimalism this works quite well for me, especially when I find myself agape at some of the scenery which is nothing more than a couple light shafts arranged in a particular manner. MirrorMoon EP is an exploration puzzler and the first world you find yourself upon serves as an introduction into the numerous mechanics that are built into it. Your viewpoint is locked however so whilst you’re in first person mode you can’t look up or down, nor even to your left or right. Instead you have to move yourself around like your entire body is encased in concrete, fixing your vision firmly forward. This, coupled with the incredibly small sizes of the world, means that your sense of location and direction is severely limited however you’re able to unlock a large set of tools that will help you find your way around and some of them are quite novel. 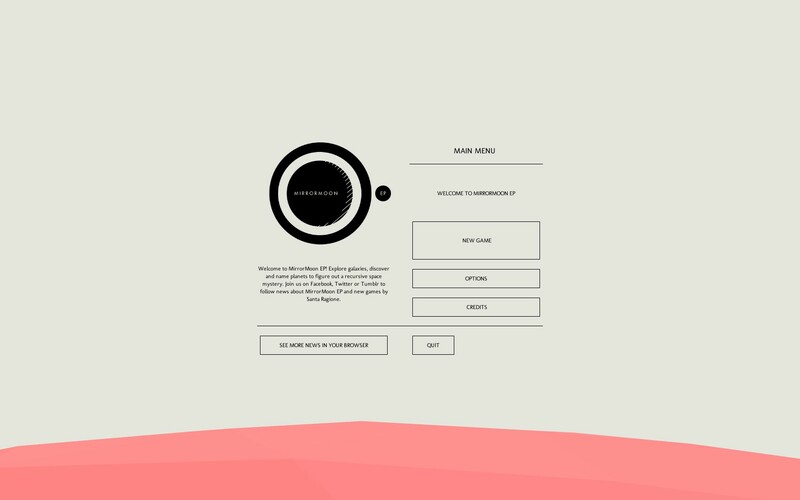 As the name of MirrorMoon EP alludes to you’ll quickly find out that there’s another “moon” nearby that, once you’ve discovered the right tools, you’re able to interact with. Initially it doesnt’ make a whole lot of sense, the first one allows you to rotate it around to see different features, however it becomes apparent that the moon you’re manipulating is in fact a duplicate of your own. Then using the tools you have disovered by randomly bumbling about you can then use it to guide yourself, allowing you to unlock more and more secrets. Eventually you’ll solve the puzzle and be treated to some more vague on screen text but after that you’re given access to the real game and it’s quite something. 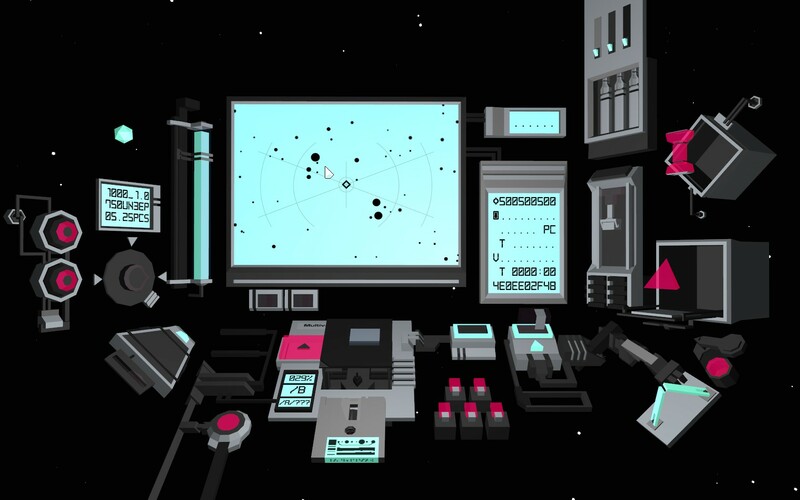 This is your console for exploring the vast space that is contained within MirrorMoon EP. Like pretty much everything else in the game details on how it operates is scant but after clicking around you’ll eventually figure out what everything does. The screen with numerous dots all over it is a map of all the other moons you can visit and each of them contains an unique puzzle for you to solve which, once completed, will allow you access to a glowing orb. Should you be the first person to find that orb then you’re granted with a special privilege. You get to name that moon. Now with the massive number of planets available I get the feeling that they’re all procedurally generated so some of them are going to be amazing and others are going to be quite dull (I believe I visited one that was completely dark and the orb was right in front of you). The names are also persistent and you’ll be able to tell if someone’s named a planet by the name being something other than THX/89 or something of a similar format. I managed to haphazardly visit another person’s planet without realising it but soon after found myself seeking out all the planets I could in order to solve them before anyone else did. Whilst is a pretty novel and interesting mechanic it unfortunately gets boring quite quickly as whilst the planets are usually different in some way a lot of the time it’s just a jumble of various mechanics mashed together procedurally. Once you’ve seen a dozen or so planets you’ve likely seen them all and so what initially seems like something with infinite replay value quickly fades into repetition. I do like the idea though and for some people I’m sure this would be infinitely interesting (kind of like Kerbel Space Program in a way) but for me I just couldn’t be bothered after a while. Now I’ll have to admit some fault here as whilst I managed to complete the first “side” easily (and got the achievement to that effect) I haven’t yet been able to figure out how to finish side B in order to get a complete understanding of the story. It does seem quite interesting, especially with the references to the “anomaly” and how the machine interacts with space and time, however the intentional vagueness of both the game and the story have curtailed my efforts to dig up any substantial meaning from it. I could just Google it, like I did for Kairo, and I probably will if I don’t find out anything more soon. MirrorMoon EP is an interesting game, one which is heavily shaped by your own experiences with it. 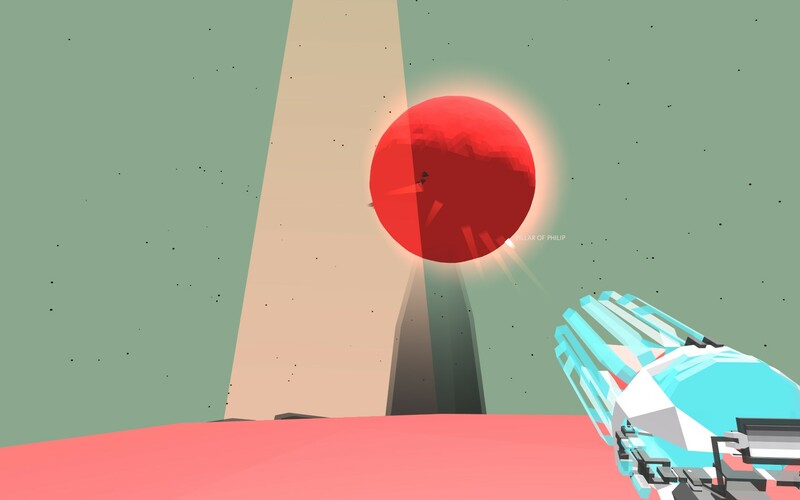 The unapologetic, minimalistic nature of it will definitely be a turn off for some however the heavy focus on the game play to the exclusion of nearly everything else is something that MirrorMoon EP pulls off exceptionally. Unfortunately I feel like it’s replay value is somewhat limited due to its procedural nature and the intentional vagueness of both story and gameplay may have lead to me giving up on it prematurely. Still MirrorMoon EP stands out as yet another shining example of the indie exploration/puzzler genre and is definitely worth looking into. MirrorMoon EP is available on Steam and OUYA right now for $9.99. Total game time was around 2 hours with 40% of the achievements unlocked.